Capacitor LED watch for fans of science fact or fiction. Sam says: I played once more with digits that got stolen the center segment and thought about emphasizing the the void on the hardware level of the watch design. This is how the two columns of LEDs were made. At first those columns are seen as single information units but the way to read the watch is across the center gap which nobody will know when you show them the watch. I let the lights seem to originate from the bottom side of the casing, getting stronger on the top side and then suddenly stop. 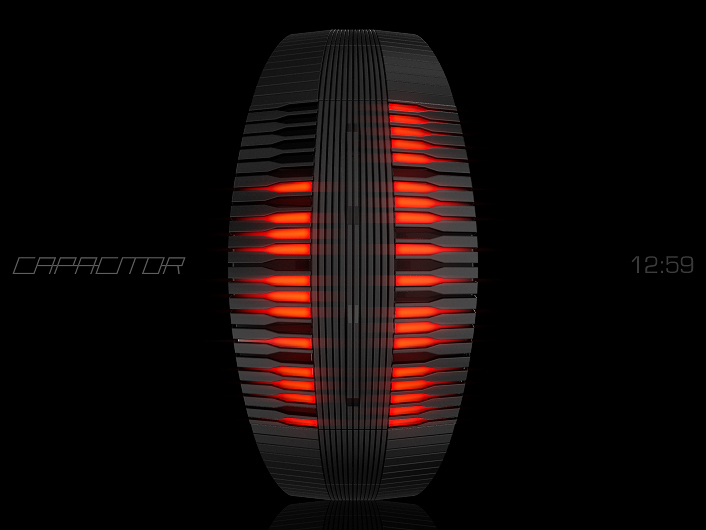 This bilateral design reminded me of a capacitor, and so the name was born. The over-the-edge design of the case in combination with the free center of its top face resulted in placing the necessary buttons between the LEDs. 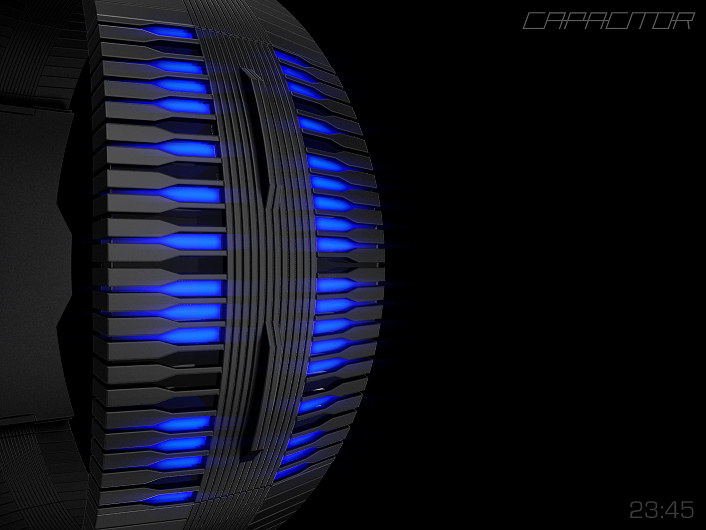 The Capacitor LED watch is for fans of science fiction as well as science fact. This entry was posted in Design Submissions and tagged alien, Bracelet, cryptic, digital, easy watch, futuristic, LED Watch, lines, sci-fi watch, Watch Design Submission. Bookmark the permalink. It’s a stunning look & right up my street. Excellent work. At first the digits were a little elusive, but as I squint my eyes it suddenly became apparent. Seeing through the gap is key & I think your ‘in motion’ effect of the circuit lines also help to close the gap. I have always liked your Zipr watch & this has some similarities. I cannot decide now which I like more. The digital element of this one, or the close knit of Zipr. The Zipr inspired me to make this one. And then I tried to be different to have a stand-alone design. Actually I also tried to be not too close to the Neutron, once I realized the similarity. I purposedly placed vertical lines in the gap to distract from the solution and now the motion blur of the LEDs helps a little… totally unplanned hehe. Initially it impossible to read, but once you know how, easy. I had to look at the final image to get it, then wondered why I hadn’t seen it before. Great cryptic design. It is also one that is a great combination of display & case. Just the sort of design that TF needs in its catalog. My only question is around the a & b styles for the numbers. Are you giving these as options or are there certain circumstances when you intend to use one or the other? Thank you for the comment Nev! I’ve posted this watch on Colony a while ago and there appeared different preferences for the 0 and the 8. Argh I forgot to mention that in the description. 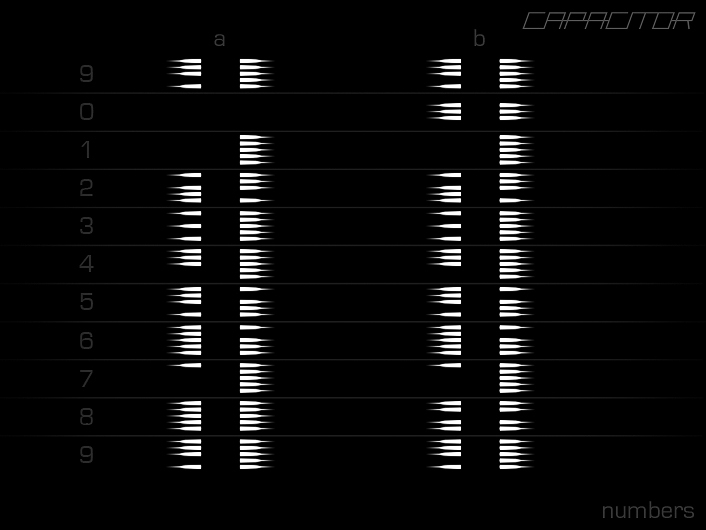 Some people prefer logical numbers, that’s column a (0 = nothing, 8 uses the maximum of digits, like with normal LED numbers) and some prefer visual numbers (0 having a voluminous center area, 8 having a narrow one). Wonderful design! I was unable to read it at first too, but after a while I grasped the concept. 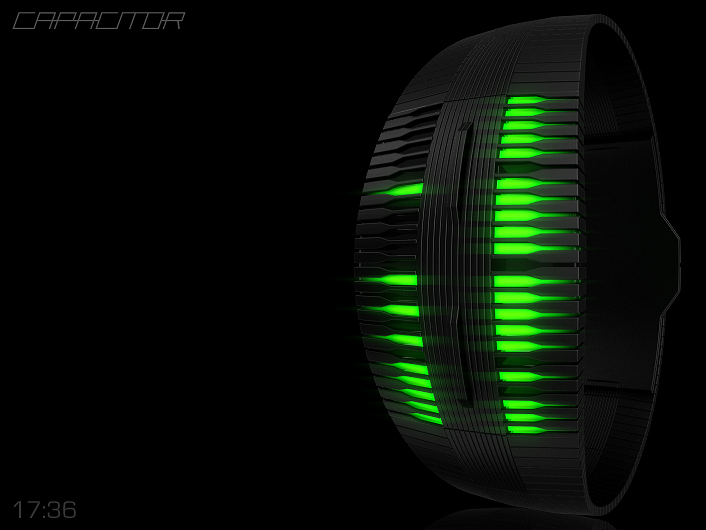 The function and form are well mixed together into this sci-fi watch. Good job Sam! I like the reading & the overall look. I like the choice you made for the buttons! Adding a scrolling animation would be nice! Thank you for the insight! Yes, so many LEDs have to be used for animation. That would look cool. I was lost until I saw the last panel–very nice, Sam! I still really like the Zipper watch concept. Good good Chris 🙂 Thanks for the nice comment! This is a great looking watch. I too was rather stumped when I first looked at the display, but then it hit me. Incredibly cool. I’ll definitely be near the front of the line if this becomes reality. Good to know 😉 I’m glad that it’s solvably cryptic for you guys. I can’t help but wonder( *_^ how it would be if you could switch the 2-button-interface for a (darkened) touch-based display.